One of my favorite films when I was young was Big, staring Tom Hanks. Big tells the story of a 12 year old kid who is at the stage in his life where he is just barely to small for the finer things in life such as going on sweet roller coasters and hooking-up with tall chicks. After being embarrassed, because of his size, he stumbles upon a mysterious fortune-telling machine, called Zoltar Speaks, which granted Josh Baskin (Tom Hanks character) a wish. He wished to be big. The next day Josh woke-up as a 30 year old, and the kid as an adult in the adult world hilarity (and a little heartache) ensued. I own the VHS and randomly the Blu-Ray. 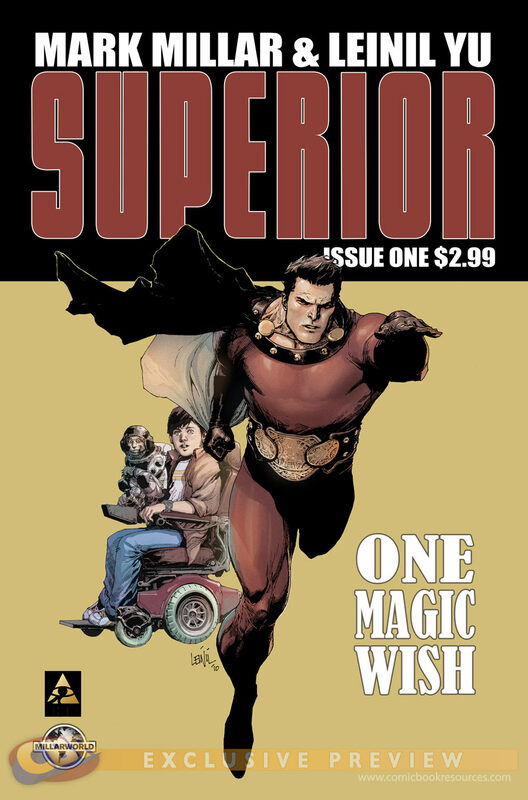 Superior #1 is basically the same story as Big with a couple of minor changes: the main characters size doesn't hold him back but rather his physical ability, and instead of a fortune-telling machine the comic of the day uses a speaking space monkey. The similarities that are pretty much exact include: the main kid first turning into his wish in his room and going to his best friend with his dilemma, first. Plus, I'm pretty sure there is a page when that song, "The space goes, down, down baby, down by the roller coaster..."
The story does have some differences, but the feel is very much like Big. I can already see the direction of the story going towards a kid as an adult in the adult world thing happening, except add the phrase super-powered in there somewhere. I wonder if the chick from Showtime's Weeds will be in the upcoming issues?